Steve Rajeff was born and raised in San Francisco and is a graduate of San Francisco State University. He has been involved with numerous fly casting schools since the 1970’s, many with mentor Mel Krieger. He has conducted fly casting lessons and demonstrations in Argentina, Chile, Bahamas, Japan, Russia, South Africa, and many countries across Europe. He is a life member of the Golden Gate Angling and Casting Club, Hall of Fame member of the American Casting Association, and former Board of Director International Casting Sport Federation, and Federation of Fly-fishers Board of Governor- Certified Casting Instructors. He has been a dominate presence in the world of competitive casting for over four decades and has won the American Casting Association All Round Championship 42 times and 14 World All-Around Championships. As the Director of Engineering for G.Loomis rod manufacturing, he uses his casting and fishing experience to hone rod performance characteristics like rod action, taper, weight, strength, balance and durability. 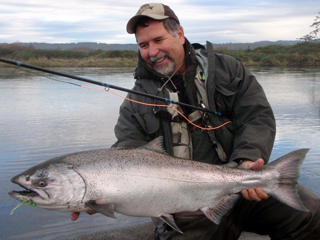 With over 50 years of intensive fishing, 5 years fishing guiding in Alaska, 2 years in Montana – his experience is directly responsible for designing high performance fishing rods. Steve estimates he has developed over 2,500 rod models across all categories, during his 30 years as head of engineering for G.Loomis. Steve’s largest fly caught fish was a tarpon estimated at over 180 lbs. For me, “It’s no longer about the most or biggest fish, but enjoying the challenges and appreciating the beautiful places fishing and casting take me”.